Have more questions? Please visit our FAQ page. For a brochure, please click here. The Between Two Homes® Coparenting Class is our live class offered to families outside of the Dallas-Forth Worth metropolitan area including the counties of Collin, Dallas, Delta, Denton, Ellis, Hunt, Johnson, Kaufman, Parker, Rockwall, Tarrant, and Wise. The class is more than just a basic coparenting class, and it's not a parenting education class. The class exceeds the guidelines for coparenting education courses in Texas. Our instructors are professionally dedicated to helping families transition during changes and meet the needs of children growing up between two homes. The Between Two Homes® Coparenting Class focuses on how families can meet the needs of children growing up between two homes. The class is well reviewed and suggested by participants. For reviews, please visit our reviews page. The class consists of two parts 3.5 hours long that may be taken in either order, though we encourage you to attend Part I first. 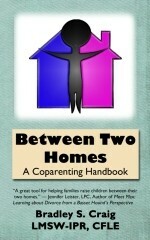 Part I of the class focuses on adult issues related to coparenting and keeping children out of the conflict. Part II of the class focuses on child development and the needs of children growing up in two homes. All participants receive a certificate at the end of each class. To earn a certificate, all participants must stay the full duration of the class. Plan to arrive 15 minutes prior to class time for registration. Admission is not allowed after the class begins. Please note you are securing your seat for this class when you purchase your ticket similar to buying an airline ticket. Fees are not refunded to participants who do not show up or those who show up late. Cancellation payments must be received by BTH before 5:00 pm CST two days before the day of the class. To cancel a ticket to a class, you must follow the instructions on the middle of the FAQ page. Please select your class carefuly, there is a $5.00 cancellation fee charged per cancellation request which must be paid prior to confirmation of the requested change. The class has two parts. The fee for each part of the class is $40.00 per person per part. For directions to the class locations, please click here. All classes require one ticket per person. If tickets are sold out prior to the deadline, you will not be able to purchase a ticket for that class. DIRECTIONS TO LOCATION: Operators are not on call for phone directions, so we encourage you to print out a map to the location prior to departure. We are not responsible for GPS instructions or other online map issues that are independent of the links provided on our maps page. There is NO LATE ADMISSION to the class. Doors are locked at the start of class so we encourage you to arrive 15 minutes prior to the start of class. Your ticket reserves your seat on the date you selected. CANCELLATION POLICY: Cancellation payments must be received by BTH before 5:00 pm CST two days before the day of the class. To cancel a class, you must follow the instructions on the middle of the FAQ page. There is a $5.00 cancellation fee charged per cancellation request which must be paid prior to confirmation of the requested change. You must use the same e-mail address you used to purchase the ticket, to cancel your ticket to the class. REFUND POLICY: If you do not cancel your ticket BEFORE the deadline, if you do not arrive on the date you specify or if you arrive late for the class, your money for that specific ticket will NOT be refunded or credited. Think of it as an airline ticket, if the plane leaves and you don't cancel in advance you won't get your seat refunded. Doors are locked at the start of class so we encourage you to arrive 15 minutes prior to the start of class. The use of electronic devices such as cell phones, laptops, recorders, cameras, video taping or audio recording during class is strictly prohibited. Neither session is appropriate for children. No childcare is provided. Please do not bring children of any age to the class. If you bring a child to the class, you will be turned away and no refund will be provided. There is no waiting area for anyone not participating in the class. In order to participate in the class, you must have purchased a ticket in advance. We do not provide meals, but you are welcome to bring food and non alcoholic beverages to class. Please bring your PayPal receipt to class to confirm your registration, or have it readily accessible on your smart phone to show it to the instructor. For the online version of the class called Making Two Homes Work class, click here.